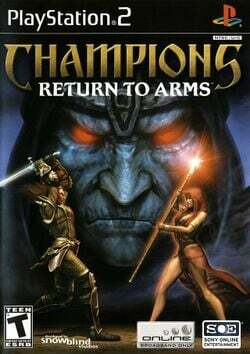 Game description: Champions: Return to Arms brings all the hack-and-slash gameplay from Champions of Norrath back to the PlayStation 2. This sequel offers unlimited battles, dangerous missions, and the ability to import characters from the original game. Experience more than 50 levels solo or with three other players, either offline or online. The more medals you earn, the more secret gameplay modes you unlock. Return to Arms offers a host of new monsters, races, items, and artifacts to keep you busy. Sequel to Champions of Norrath, the story picks up after Innoruuk, the Prince of Hate has been defeated, his essence shattered into the Shards of Hatred and were strewn across the Planes of Power. Within the game story, players have the choice of serving either the forces of Good by destroying the shards to rid the world of Innoruuk, or the legions of Evil gathering the shards to resurrect the fallen god. The paths of Good and Evil travel to the same locations, with variations in mission objectives. Status goes from ingame to playable. Runs near full speed. Right half of screen is blank if GSdx is in Hardware mode. Looks fine, apart from occasional texture corruption in Software mode. Description: Only half of the screen is displayed. Workaround: The issue has been fixed for the Direct3D11 and OpenGL renderers, and "Native" scaling resolutions as of at least PCSX2 stable release v1.4.0. Go Config > Video (GS) > Plugin Settings, and make sure Renderer isn't set to "Direct3D9 (Hardware)", and Internal Resolution isn't set to Custom Resolution. Description: Game might crash after a certain amount of time. This page was last edited on 2 November 2017, at 13:50.